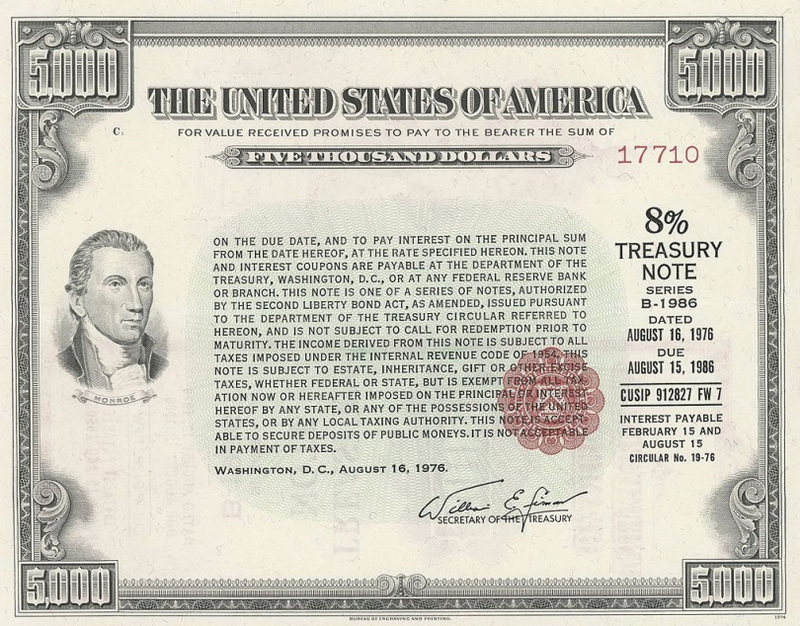 A treasury note is a marketable U.S. government debt security with a fixed interest rate and a maturity between one and 10 years. Treasury notes are available from the government with either a competitive or noncompetitive bid. With a competitive bid, investors specify the yield they want, at the risk that their bid may not be approved; with a noncompetitive bid, investors accept whatever yield is determined at auction. Treasury notes are extremely popular investments, as there is a large secondary market that adds to their liquidity. Interest payments on the notes are made every six months until maturity. The income for interest payments is not taxable on a municipal or state level but is federally taxed, similar to the Treasury bond. The only difference between a Treasury note and bond is the length of maturity. A Treasury bond’s maturity can last from 10 to 30 years, making Treasury bonds the longest-dated, sovereign fixed-income security. The longer the maturity, the higher the note’s or bond’s exposure to interest rate risks. In addition to credit strength, a note/bond’s value is determined by its sensitivity to changes in interest rates. Most commonly, a change in rates occurs at the absolute level underneath the control of a central bank or within the shape of the yield curve. A good example of an absolute shift in interest rates occurred in December 2015 when the Federal Reserve (Fed) raised the federal funds rate range by 25 basis points to 0.25 to 0.50%. This increase in benchmark interest rates has had the effect of decreasing the price of all outstanding U.S. Treasury notes and bonds. Moreover, these fixed-income instruments possess differing levels of sensitivity to changes in rates, which means that the fall in prices occurred at various magnitudes. This sensitivity to shifts in rates is measured by duration and expressed in terms of years. Factors that are used to calculate duration include coupon, yield, present value, final maturity and call features. In addition to the benchmark interest rate, elements such as changing investors’ expectations create shifts in the yield curve, known as yield curve risk. This risk is associated with either a steepening or flattening of the yield curve, a result of altering yields among similar bonds of different maturities. For example, in the case of a steepening curve, the spread between short- and long-term interest rates widens. Thus, the price of long-term notes decreases relative to short-term notes. The opposite occurs in the case of a flattening yield curve. The spread narrows and the price of short-term notes decrease relative to long-term notes.